Simply explained, having a balanced diet is very crucial for body functioning. Keeping your protein, carbohydrates, fats and vitamins in the optimum level will help you feel good, maintain your body weight and have a healthy overall profile. If people do not consume the adequate amount of protein per day, their body will not function properly in terms of growth and healing. Furthermore, if somebody does not consume enough energy, then problems such as fatigue will occur and most probably you will not be able to perform some daily tasks. On the contrary, increased consumption of energy can lead to obesity or overweight related health problems. A huge percentage of English and American population is either obese or overweight. That is a consequence of eating more food than we actually need. And it is not only foods that give these results but also drinks high in sugars and calories. Just to be clear, a balanced diet means eating a wide range of foods in the right quantities. Foods that contain fats and simple sugar such as sweets and chocolate. Fruits and vegetables are a great source of vitamins, minerals and antioxidants. According to dietitians, it is recommended to consume five portions of mixed fruit and vegetables per day. The 5-a-day idea in terms of a balance diet, in order to control your sugars, should contain more portions of vegetables than those of fruits. Fruits contain fructose which according to studies, in moderate amounts significantly can impair insulin sensitivity in healthy people. In order to achieve the 5 per day, you can just replace unhealthy biscuits with a tangerine or an apple, add some leafy vegetables to your lunch and dinner and add a fruit to your breakfast. Starchy foods such as cereals, pasta, bread and maize are an important part of a healthy balanced diet. Like fruits and vegetables, starch foods as well are high in vitamins and minerals. Your body needs this food group to get the energy it needs to fuel your everyday demands. Starch foods according to NHS, should represent almost the 50% of everything we eat. This means that this group is of vital importance and we should make sure not to eliminate its recommended daily amount. In order to keep your diet balanced and healthy, opt for the whole grain varieties such as brown rice, whole wheat pasta and brown bread. These foods contain more fiber, which can help you with your weight balance and prevent you from many diseases. Just remember that fiber can be also found in beans, peas and lentils. The most important thing about this category is that these foods are great sources of protein, which is vital for growth and repair of your body. Furthermore, this group also contains plenty of vitamins and minerals that cannot be found in any of the groups we mentioned before. For example meat, is high in protein, vitamins and minerals such as iron, zinc and vitamin B12. If you want to control your calories but stay healthy, try to eat lean meats such as skinless poultry, chicken breast and turkey. However make sure that you are consuming red meat 2-3 per week, since it is the only kind of meat high in iron. Fish is another great source of protein. What is more, fatty fishes are rich in omega-3 fatty acids. It is well known how important are omega 3 in our diet, in terms of health, thus aim to consume fish at least 2 times per week. Finally eggs and nuts are also great source of protein and should be part of a balanced diet. Their high content in omega 3, amino acids and polyunsaturated fats make them a great alternative of snacks high in trans fats. Studies have shown that people who consume more than three eggs per week had considerably elevated intake of vitamins A, D, B12, zinc and magnesium when compared with those that were not eating eggs. It is important to note that the high content of eggs in vitamin D is remarkable since, only a few foods are labeled as good sources of vitamin D.
The most important thing about this food group is that is high in calcium, where not other category can reach this level in this mineral. Calcium is known to keep your bones healthy and help your body function properly. To enjoy the benefits of dairy products without consuming too much fat, try to choose semi-skimmed milk, 1% yogurts or low fat cottage cheese. Fats and sugars both contain enough energy to fuel your body. However, we can easily end up eating too much of them, which can lead to weight gain. Try to balance your intake of this category by limiting simple sugars added in foods and desserts as well as “bad” fats. In order to avoid being in risk of health problems, try to avoid foods high in trans fats and saturated fats found in baked cakes and fried foods. The fats that you need to add to your diet to make it balanced and healthy are monounsaturated fats and polyunsaturated. This category of fats comes from olive and canola oils, fatty fishes, flaxseed and walnuts. Try also to keep this category of foods in moderation since they are high in calories. All in all, keeping your diet balanced is of great importance since a deficiency of a single nutrient can lead to a range of health problems such as muscle attenuation, osteoporosis, growth problems, anemia, cognitive problems and many other serious health problems. Since every person is different though, the recommendations of each food group to keep your diet balanced vary. 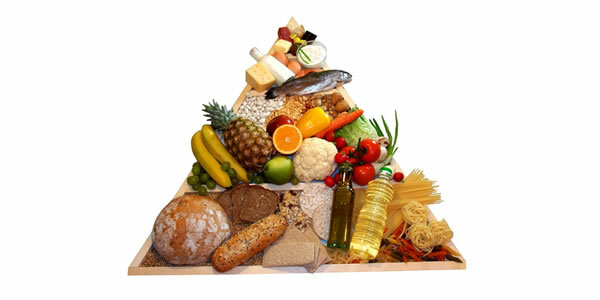 Thus it is better to always consult your nutritionist or doctor to find out how “balanced” you are in terms of diet.